There are books, many of them, that can be praised for the manner in which they settle a subject. In some ways, they are an end, a closure. (So was the still contested identification of the Higgs boson, believe it or not!) Encyclopedias would qualify as examples, so would textbooks (the Foundations of . . . type). Such books, as valuable as they are, do not open up a perspective. They are good photographs of a landscape at one moment in time. Consulted one day later (no exaggeration! ), they remain, due to the circumstances of very rapid advances in knowledge and discovery, rather of documentary relevance. The number of such end-of-the-road (or dead-end) books is rapidly diminishing. There are other books that remind readers of an ongoing diagnostic process – and invite to action. For a reviewer, the first category of books is a test of knowledge (how complete, how precise, and how many errors), and the second category is a test of relevance. Concepts and Fuzzy Logic, edited by Radim Belohlavek and George Klir, is a well-designed case study. It consists of contributions that create a solid background for discussion. Most important, the book advances an understanding of how the science domain – concepts – and the methods of enquiry – fuzzy logic – can be successfully integrated. It is the meeting point between one of the most important subjects of epistemology – acquisition and expression of knowledge – and fuzzy logic as a particular scientific perspective and methodology for making acquisition and expression of knowledge possible. This is a book about learning the language of science and using it to define questions, to seek answers, and to share the results in the hope of further improvement. Let us dwell on this thought. It is easy to uncover errors in a text or in an argument; it is way more difficult to make a case in favour of a perspective that was, for better or worse, declared inadequate. In terms of the detective story mentioned in the opening, the book correctly points to the fact that similar â€˜crimes’ were committed in the past. Mentioning the famous Minsky and Papert’s (1969) study of the perceptron provides the broader justification for the recollection of an incident from 32 years back. Indeed, when a voice of authority (Osherson, Smith, Minsky, Papert, or whoever might be wearing the blinders) gets involved, the consequences can be considerable. In fact, prior to Osherson and Smith’s article, the psychology of concepts adopted a viewpoint congruent with that of fuzzy logic: degree of membership came up in publications; experiments informed by fuzzy logic were designed and carried out in a variety of locations; and funding supported the effort. Imprecise concepts (and which of them is not?) invite considerations of variables with fuzzy membership functions. After 1981, this changed. For those familiar with neural networks and connectionism, the same happened after Minsky and Papert took Rosenblatt’s perceptron under their scrutiny. They did not reject it (â€˜The perceptron has shown itself worthy of study’); rather, they claimed that it was inherently incapable of global generalization, and that even multilayer neural networks would not fare better (â€˜The extension to multilayer systems is sterile’). Neither the editors of this book nor the various authors discuss the fact that publishing negative positions by authors of reputation is consequential, and not only for scientific dialog. After all, science advances not by reports on experiments but by confrontation of viewpoints. There is no such thing as the last word in science (the argument of authority even less). This is where the crime is committed. Hiring scientists who pursue a different path becomes problematic. Funding, even more so. Let us face it: at the Directorate for Social, Behavioral, and Economic Sciences (in particular the Division of Behavioral and Cognitive Science) at the National Science Foundation, psychologists had their say for the longest time. Consulting the list of successful applications shortly after Osherson and Smith’s article appeared leads to the observation that grants were no longer awarded for research involving fuzzy logic. (In the case of neural networks, the computer science community, AI research, in particular, lost almost 20 years!) To be very clear: the integrity of the authors mentioned is not questioned here. They themselves, as far as is known, did not prevent any grant from being awarded, or the hiring of any applicant who did not align with their viewpoint. The politics associated with scientific authority turns one viewpoint against the others. Fuzzy logic has a long history of being undermined in the politics of science (especially in the USA), while in parallel proving its significance in a variety of spectacular applications. This book review was suggestively framed as a detective story on purpose. Few, even among psychologists, would care for the psychology of concepts. Some of these few, sceptical of a science of concepts, would go so far as to maintain that there is no reason to make a fuss over fuzzy logic being rejected. The rejection could only be detrimental to their research. Indeed, in our age of extreme specialization, the generality of concept and speculations about words are of marginal interest. Moreover, those somehow familiar with the field question its legitimacy, at least on account of its history. Arguments were presented within pragmatism with respect to knowledge and intelligence as originating in pre-linguistic activity. The psychology of concepts always denigrated what was not psychology, without ever having produced proof that concepts are psychologically defined. Those active in the field tried to appropriate philosophical, logical, linguistic, anthropological, cognitive, etc. explanations, such as those of Arnauld and Nicole (1662), Bruner, Goodnow, and Austin (1956), Goguen (1969), and Lakoff (1973). Fisher’s (1916) work gives a broad account of introspective activity (almost half her book is a collection of reports). Hull (1920) adopted a behavioural perspective and generated interest in empirical aspects of concept awareness. Smoke (1932) finally brought up what in the first place should be of interest to anyone (psychologist or not): what do people do with concepts? The response and whatever the concept presents are of interest to him (although â€˜unknown neuromuscular and neuroglandular events that occur in the formation of any given concept’ is more than a deterministic stretch). In 1975, Professor William Kahan, a colleague of mine, a superior intellect and a Turing Prize winner, had this to say: â€˜Fuzzy theory is wrong, wrong and pernicious’. I cannot think of any problem that could not be solved by ordinary logic. What Zadeh is saying is the same sort of things: Technology got us into this mess and now it can’t get us out. What we need is more logical thinking, not less. The danger of fuzzy theory is that it will encourage this sort of imprecise thinking that has brought us so much trouble. The fuzzy logic tutorial is neither partisan nor missionary. I recommend this tutorial for students and scientists (even those not working in the concept definition area), as I recommend Machery’s tutorial. Believe it or not, fuzzy logic is still not well known among those in academia, or even among those active in research. The question of relevance with respect to the psychology of concepts (What is it good for?) can be asked also with respect to fuzzy logic. The first answer I would like to suggest has to do with the subject of the book. Recently, Meech (2011, University of British Columbia) submitted to an informal discussion on the significance of fuzzy logic a text entitled â€˜How some simple fuzzy thinking might have prevented the Challenger accident’. His concept is SAFETY. This comes from the knowledge domain of underground mining. 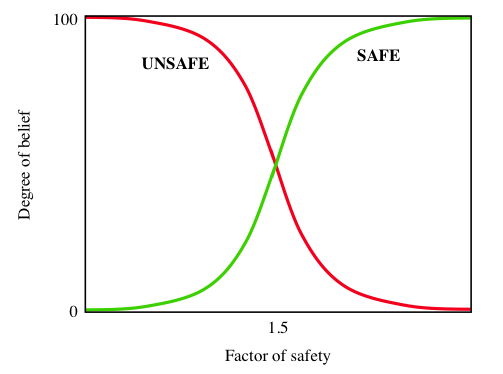 A crisp definition of SAFE/UNSAFE and the assumption that a Factor of Safety of 1.5 would be acceptable are considered in the decision making. 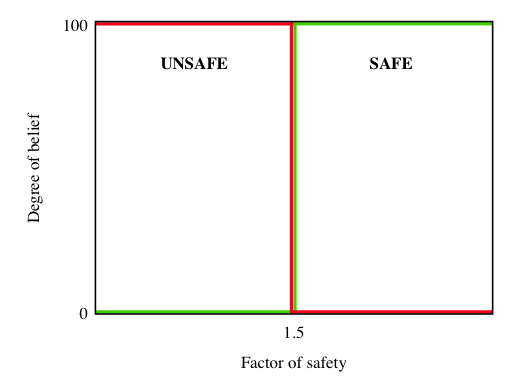 By using crisp definitions of SAFE and UNSAFE, these terms are true and false, respectively, when the Factor of Safety lies at 1.5 or higher and are false and true, respectively, when it lies below 1.5 (Figure 1). 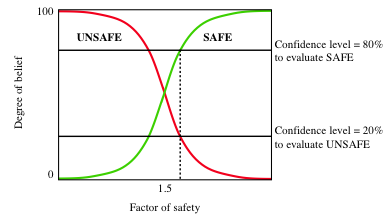 Once fuzzy reasoning is applied, it turns out that SAFE and UNSAFE are no longer mutually exclusive, but complementary (Figure 2). In what turns out to be the most enjoyable text in the book, Eleanor H. Rosch (Chapter 4) puts the whole enterprise in its real focus: given a scientific enquiry Si, which are the means of enquiry Mi appropriate to the task? Better yet: does the question define the tools or do the tools shape the question? Arguments regarding logically empty and logically universal concepts. This is in reference to conjunctions and disjunctions of complementary concepts. Failing to acknowledge the expressive capabilities of fuzzy logic. This is in reference to the concept of financial wealth W(x) = f[L(x), I(x)] as a function of liquidity L(x) and investment I(x). Osherson and Smith ascertain that f is maximum (fuzzy disjunction, union), which would contradict their experimental data. The reason for their error is that they do not know that function f can be more than what they assume it to be (e.g. it can be a non-standard union). Set inclusion and universal quantification misunderstood. This is in reference to the truth degree of propositions, in particular the fuzzy truth function. Technical errors in using fuzzy sets. The analysis is factual, very precise; the conclusions (well tempered) are quite convincing. In the process of debunking some of Osherson and Smith’s arguments, BÄ›lohlvÃ¡ek and Klir express their own view of fuzzy logic. This view is consonant with mathematical formalism. BÄ›lohlvÃ¡ek, in the chapter he authored (â€˜Formal Concept Analysis: Classical and Fuzzy’), offers a very solid method that combines two different, though related, perspectives. By no means would this review underestimate all other contributions. The book is intended not only to address an error (and its consequences), but even more to open new avenues. â€˜Representing Concepts by Fuzzy Sets’, by J. Verkuilen, R.A. Kievit, and A.Z. Scholten and BÄ›lohlvÃ¡ek’s â€˜Formal Concept Analysis: Classical and Fuzzy’ illustrate this intention. The examples that follow (the issue of â€˜Conceptual Combination and Vagueness’ authored by James A. Hampton) are more suggestive for what is â€˜cooking’ in the â€˜kitchen’ of the psychology of concepts. But they also point to those characteristics of fuzzy logic, which are still debated in the scientific community (in particular the definition of the membership function). That semiotics remains terra incognita (or even a place to run away from) for psychologists is not surprising. Too bad. That Peirce’s Logic of Vagueness (Nadin 1980) is ignored might be as relevant as the rejection of fuzzy logic. That concepts might be constructs seems to be a unanimously ignored position. Again: too bad, since the construct fuzzy logic has been subjected to the criticism that reality (whatever that is) is not fuzzy. Constructs, such as circles, numbers, words, sets, concepts, and so many others, are the embodiments of new gnoseological perspectives. They open avenues to knowledge and to new applications. Osherson and Smith missed the point and identified fuzzy logic with a theory of concepts only because, initially, concepts (bold, tall, good, etc.) served as examples of graded descriptions and of weighted memberships. But those were examples. As we know, arguments based on examples can succeed only when the examples disappear, i.e. when the level of abstraction definitory of science is reached. Western civilization never outgrew the old confusion between names and what they stand for (nominalism vs. realism). In all fairness, a constructivist perspective would have given this book even more convincing power. One more reproach: given the nature of the subject (concepts are expressed in the form of words), the possibility of computing with words (yet another extension of Zadeh’s fuzzy perspective) is a natural suggestion (as controversial as fuzzy logic itself). In the months of reading and re-reading this book and researching adjacent subjects, I had two experiences related to what this book is about. 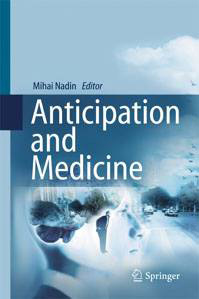 First: pursuing my interest in the subject of anticipation (which psychologists have difficulties relating to), I took note of a sloppy use of the concept (Nauts, Metzmacher, Verwijmeren, Rommeswinkel, and Karremans 2011) and provided a critical statement (Nadin 2012). The authors would not take the matter of concept discipline at heart, and would argue that the dictionary meaning confirms their use. (Lucky me, they did not refer, as many do, to Wikipedia, the new authority in matter of everything.) Of course, the use of concepts cannot be legislated more than morality can. But Peirce, in arguing for an ethics of terminology, warned that progress in science depends to a large extent on the proper use of concepts. Second: I took note of an interesting set of new questions focused on the notion of degree of belief, degree of confidence, and related topics. A long (and protracted) discussion on uncertainty [within the Berkeley Initiative in Soft Computing (BISC)] brought up the never-ending contradistinction between fuzzy descriptions and probabilistic descriptions. Fundamentally, for me these are issues of representation. We describe the world as we experience it. Some descriptions are more helpful to what we do than others. Those descriptions are not always independent of each other. Each representation simultaneously constitutes the reality it describes. But this is already a bit outside the subject of the book under discussion. The concept of uncertainty is intuitively related to probabilities (actual, statistical data, such as in the uncertainty of weather, of extreme events, of market behaviour, etc.). 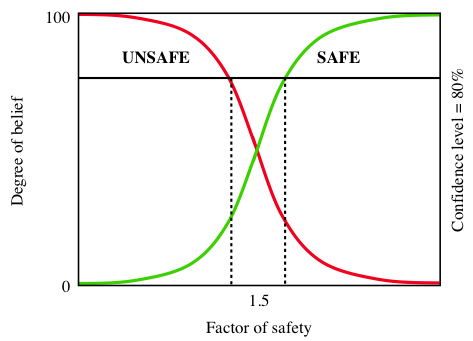 Some researchers (Dimitrov, Koshelev, and Kreinovich 1997), focused on acausal processes, showed that such processes lead to non-statistical uncertainty. Their hypothesis is that fuzzy logic is appropriate for describing â€˜highly unprobable’ events (such as those they study in astrophysics). Am I wrong in assuming that concepts are â€˜highly unprobable’ occurrences associated with human activities? The question is a hypothesis (abduction) worth pursuing. It would be naive to interpret the experiences I have described as the seal of approval for fuzzy logic. Neither does the book make such a claim. But it suggests that the bridge among sciences is built as we progress in our more comprehensive understanding of ourselves – as the originators of concepts – and of the world – about which concepts say something, not always very useful, or not immediately well understood. Arnauld, A., and Nicole, P. (1662), La logique, ou l’art de penser. BÄ›lohlvÃ¡ek, R. (2004), â€˜Concept Lattices and Order in Fuzzy Logic,’ Annals of Pure and Applied Logic, 128, 277–298. BÄ›lohlvÃ¡ek, R., Klir, G.J., Lewis, H.W. III, and Way, E. (2002), â€˜On the Capability of Fuzzy Set Theory to Represent Concepts,’ International Journal of General Systems, 31, 6, 569–585. Bruner, J., Goodnow, J., and Austin, G. (1956), A Study of Thinking, New York: John Wiley. Dimitrov, V., Koshelev, M., and Kreinovich, V. (1997), â€˜Acausal Processes and Astrophysics: Case When Uncertainty is Non-Statistical (Fuzzy? ),’ Bulletin for Studies and Exchanges on Fuzziness and its Applications (BUSEFAL), 69, 183–191. Concept,’ Psychological Monographs, XXI, 2.90, 1–209. Goguen, J.A. (1969), â€˜The Logic of Inexact Concepts,’ Synthese, 19, 325–373. Hull, C.L. (1920), â€˜Quantitative Aspects of the Evolution of Concepts,’ Psychological Monographs, XXVIII, 1.123, 1–86. Lakoff, G. (1973), â€˜Hedges: A Study in Meaning Criteria and the Logic of Fuzzy Concepts,’ Journal of Philosophical Logic, 2, 458–508. its Operationalization,’ Studies in History and Philosophy of Biological and Biomedical Sciences, 38, 63–84. Meech, J.A. (2011), â€˜How Some Simple Fuzzy-Thinking Might have Prevented the Challenger Accident,’ 7 April 2011, BISC discussion group. Minsky, M., and Papert, S. (1969), Perceptrons: An Introduction to Computational Geometry, Cambridge, MA: MIT Press. Nadin, M. (1980), â€˜The Logic of Vagueness and the Category of Synechism,’ The Monist, 63, 3, 351 – 363. Verwijmeren, Rommeswinkel, and Karremans (2011),’ Archives of Sexual Behavior, 41, 753. Nauts, S., Metzmacher, M., Verwijmeren, T., Rommeswinkel, V., and Karremans, J.C. (2011), â€˜The Mere Anticipation of an Interaction with a Woman Can Impair Men’s Cognitive Performance,’ Archives of Sexual Behavior, 41, 1051–1056. Osherson, D.N., and Smith, E.E. (1981), â€˜On the Adequacy of Prototype Theory as a Theory of Concepts,’ Cognition, 9, 35–58.